Most tests contain at least a few short answer questions. The following are proven study and test preparation strategies that will help improve your performance on short answer/essay questions and tests. Teachers, professors and instructors typically give short answer and/or essay tests to see how well students have grasped course concepts, their meanings and significance. This has both pros and cons with respect to test preparation and performance. The con is that you can't just just memorize information and expect to do well on a short answer test – you must understand course material and concepts. The pro is that even if you can't remember a specific term, as long as you have general understanding of the concept in question, you can still develop an answer that is likely to get you full or partial credit. When preparing for short answer tests focus on understanding rather than memorization of facts. Focus on topics and concepts. As with all types of test questions, the best way to prepare is by studying and becoming intimately familiar with course content, concepts and material. During lectures, try to decipher what types of topics and concepts will be covered on the test by looking for hints provided by the professor. While it's still important to memorize facts and information, try and do so with in the framework of important topics that are being explored and concepts that are being taught. Make a guess as to what types of concepts will be covered on a test and create some practice questions to prepare yourself for the test. If accessible, study from previous class tests. Many students benefit by creating flashcards. On one side of a card, write definitions or other facts, and on the opposite side, write the definition. If in doubt, make an educated guess. If you are completely unsure about a question, make an educated guess since there is usually no penalty for doing so. Show your work because teachers often provide partial credit if work is shown. Make sure the work you show is accurate. When encountering confusing questions, move on to easier ones. Return to tackle more challenging questions once you've answered all the questions for which you know the answer. In some cases, you can decipher clues to answers for difficult questions from questions you've already answered. It's critical to carefully read instructions for each short answer question. What exactly is the question asking you? Often short answer questions will ask you to describe, list, compare, contrast, identify, analyze, summarize, or a combination of these. If you describe when you're supposed to compare, or summarize when you've been instructed analyze, you're test performance is going to decrease. With short answer/essay tests it's easy to loose track of time. At the beginning of the test check to see how many questions on the test and if the test is divided up into sections. Make sure to allocate a specific amount of time per section and per question. You don't want to get half way through the test and realize you only have a few minutes left. Some short answer questions may be worth substantially more than others. Make sure to allocate time to those questions that are worth the most. Always reread the question after answering it. It's not uncommon for a short answer question to have multiple parts. For example: "Compare and contrast Frye's and Bartky's accounts of social oppression with respect to gender inequality. List the differences in their views." Answering only part of the short answer question will likely result in only partial credit. If you don't understand a question or find it is bit confusing, ask your instructor for clarification. Don't be scared to ask. Chances are there are several other students who are struggling to understand it as well. Be thorough. But be concise. While opinions may differ, most teacher believe a short answer question typically require a "short" answer. That doesn't mean an answer lacking depth analysis or information. It simply means an answer that is concise and includes just enough information to accurately and fully answer the question being asked. Typically an answer that's longer than necessary isn't going to cause you to lose points, as long as you're information correct. However, if you include incorrect information in your short answer, you'll likely lose points. There are six basic types of short-answer questions. Understanding each will improve your performance on short-answer quizzes, tests and exams. When answering short-answer questions, make sure the format and type of answer you provide matches the type of question being asked. Definition questions require you to define a concept. Question: "What is a supply curve?" 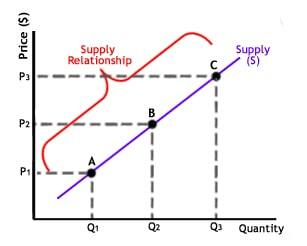 Answer: "A supply curve shows the relationship between the price of a good or service and the quantity supplied. Typically, the price appears on the left vertical axis and the quality supplied on the horizontal axis." Explanation questions require you to explain why something is true or how something functions. Question: "Why is the supply curve upward-sloping for most goods and services?" Answer: "The supply curve is upward-sloping because as the price the market pays increases for goods and services the volume that suppliers are willing to produce increases." Example questions simply require a specific real-world example of a concept or phenomenon. Question: "Provide two examples of pairs of goods that are substitutes." Answer: "Margarine and butter, and tea and coffee are examples of pairs of goods that are substitutes." Relationship questions require you to state or show how two or more things relate to one another. Are they complimentary? Are they the same? Are they different? Are they opposites? How does the existence of one affect the other? Etc. Relationship questions can be a bit more challenging than other types of short answers but are very doable if you're prepared. Question: "In a competitive market, what is the relationship between supply and demand?" Answer: "Demand refers to the quality of a good or service consumers are willing to buy at a given price. Supply represents the quantity of a good supplied by producers at various prices. The price resulting from where supply and demand meet is referred to as the equilibrium price." As the name suggests, calculations questions require you to calculate or compute a numerical answer or response. Question: "If the demand for used motorcycle purchases in the United States is represented by P = 1000 - .2Q and the supply of used motorcycles is represented by P = 400 + .2Q what is the market equilibrium price and quantity?" Answer: "The market equilibrium price (P) is 700. The market equilibrium quantity (Q) is 1,500." Graphing questions typically require a answer in the form of a graph. Question: "Draw a diagram of a supply curve that shows the relationship between quantity supplied and price." The answer is shown below. Students often confuse short-answer questions with short essay questions. While these two question forms share some common characteristics, they are different. The following are the differences between short answer questions and essay questions that students need to know for test taking. Short Answer: Someone who assigned the material (teacher, professor, etc.) who has an expert level of the information. Short Essay: Someone who has never read or seen the assigned material or topic. Short Answer: Assumes that the reader of the answer is an expert. The reader of the short answer is checking the knowledge of the author of the answer against a specific standard. Short Essay: Assumes the reader of the reader is not familiar or education on the topic being addressed. As part of the essay an overview should be provided. Short Answer: Typically, very short--no more than 3 to 4 sentences. The more concise the better. Short Essay: Answer may vary in length, but ranges from 200-800 words or more. Short Answer: Typically comes from a very narrow arena of fact-based knowledge. Details and examples provided in answer are usually limited to assigned/required readings. Short Essay: Even though the short essay typically focuses on one specific issue or topic, the information presented in the essay may come from a variety of sources. Short Answer: The answer format for a short answer will usually be a single sentence or paragraph. Short answers are concise and word selection is important to maximize effect. Short Essay: The answer format for short essays, unlike short answers, includes at minimum three paragraphs: the introduction; the body; and the conclusion. The introduction provides a general overview. The body provides the detail of the essay and varies from 1-8 paragraphs (200-800+ words). The conclusion is the wrap-up of the essay and reiterates the main points being communicated. It may also suggest an action.